5 Bedroom, 5 Bath, 6 Fireplaces, Theater, Game Room, and a view! 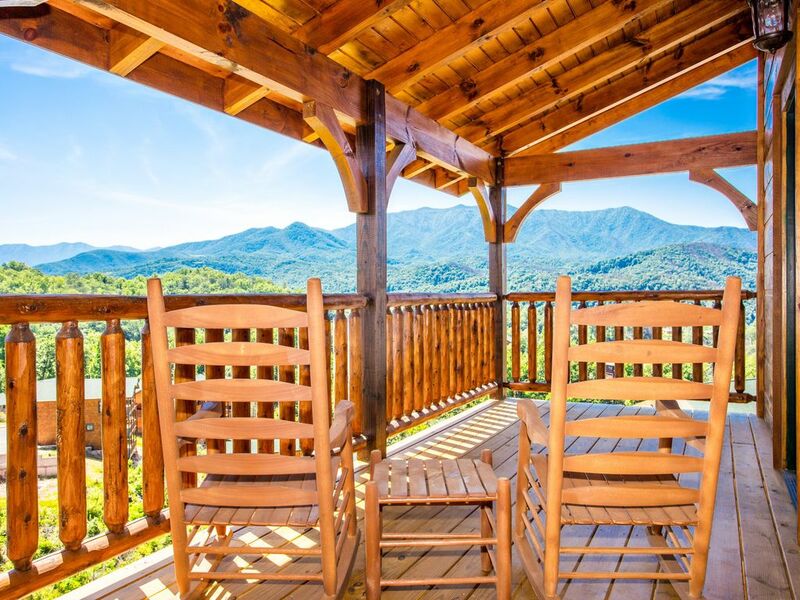 Come experience this spectacular 5 BR Gatlinburg Cabin at Gatlinburg Falls Resort. Choose "Living the Dream" for the ultimate family and friend gatherings. This unique cabin is situated near the top of the resort with fantastic views with access to the Resort Swimming Pool and Fitness Center. It offers a home theatre to watch your favorite movies or sporting events. 5 king bedroom suites all with a fireplace and adjoining full bath (including double vanity) and cable TV. Top of the line furnishings and décor. Awesome game room with a Digital Pinball, 4 Player Madden Arcade, Multicade arcade style game, and shuffle board. Massive, custom-designed dining room table that accommodates up to 14 people. Relax in the spacious hot tub on the deck. Only 5 minutes from downtown Gatlinburg, 5 minutes from the Great Smoky Mountains National Park, 12 minutes from Dollywood. Living the Dream... where you get it all but never get enough! We are a couple that believes in the work hard/play hard philosophy. We both hold down full time jobs and dedicate our time and efforts to being the best we can be. That will show in the properties that we offer. We want this to be the best "home away from home", for you as well as your friends and family. We were both raised in the South, so these mountains feel like home. We enjoy the outdoors and hiking, and Gatlinburg is surrounded by beautiful landscape with a lot of outdoor activities for all levels. Couple that with great food, thrill rides, shows, and shopping, and it becomes a place you come back to time and time again. At least we did! The cabin was great for our family of 13 which spanned 3 generations. Plenty of space and room for privacy. Great hot water capacity (that’s a lot of showers!). The kids and adults liked the game room. The kitch n was well stock and everything worked! Easy access into Gatlinburg or Sevierville within 10 minutes. We had plenty of room for our group. Loved the views, the hot tub and movie theater! Price was reasonable and property managers were attentive and friendly! Recommend!! The 9 adults, 2 children and 2 newborns were all happy with only 3 items to report as issues: 1) TV in Arcade area not working 2) One of the bedroom closets was full of Christmas decorations 3) Hot Tub issues keeping at desired temperature. Hi Terry, I am sorry we missed the mark on the TV and Hot-tub. Had we known about the problems I would have been happy to have someone out to take care of them. You didn't report the TV issue at all and I just confirmed it is working for the current guest. Very curious what the problem could have been. Per our conversation on the phone about the hot-tub I was under the impression it was working. The mode on the control panel for Sl (sleep) and St (standard) closely resemble each other. So possibly you had those confused? In the future please reach out as if it is not working optimally we would have had a repair person out to make sure it was working. I have already spoken to housekeeping about the decorations being stored in the master closet v/s the owners closet. That is taken care of. I am so sorry it caused you such an inconvenience. Unfortunately it rained a lot during our stay. But the kids were entertained the entire time by the arcade and theater. Adults were able to get some down time as the kids were so busy downstairs. Highly recommend. Despite the bad weather we had on our visit to Gatlinburg, this cabin made us feel right at home. There is tons of room for a large group vacation. We loved that each room had its own private bathroom! The owners were extremely responsive with the questions we had during our stay. All around a wonderful get away and totally stress free through the entire process of booking this place. We would definitely return in the future! Beautiful home with many amenities! We throughly enjoyed our stay at this cabin! Matt and April were helpful booking, leading up to our trip, as well as during our trip! Would definitely recommend it and plan on returning in the fall!